CONCORD, N.C. – Fifteen-time NHRA Funny Car champion John Force describes daughter Courtney as an extrovert, daughter Ashley as an introvert and third daughter Brittany, well, he admits he has yet to figure out their 26-year-old sister. However, there is one thing Courtney and Ashley have in common – both are successful NHRA Funny Car drivers. After 2010, Ashley stepped out of the cockpit to start a family. Two years later Courtney stepped into a Funny Car. 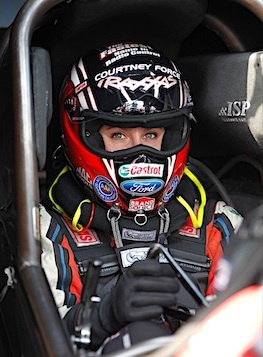 In her rookie season, the 24-year-old Courtney is battling for the Funny Car championship. She took one victory into the Countdown to the Championship and was seventh in the standings heading into Sunday’s AAA Texas Fall Nationals where she’s the No. 1 qualifier. For John and Courtney, the relationship of car owner/father and driver/daughter has been complicated at times this year, frustrating and occasionally argumentative. And last weekend at zMAX Dragway in the O’Reilly Auto Parts Nationals at Concord, N.C., it was competitive as the two were pitted against each other in the opening round. Courtney qualified sixth, while her father was 11th quickest. John defeated Courtney in the first round; then lost to John Force Racing’s Mike Neff in the quarterfinals. John notes he and Courtney will go “nose-to-nose” whereas Ashley would walk away from him. Courtney admits the relationship with her 63-year-old father can be a “little overwhelming” at times and he doesn’t always know when to leave her alone. Such was the case at the U.S. Nationals in Indianapolis when Courtney wasn’t happy with her performance. On the other hand, John was proud of his daughter’s performance. He saw the fans backed up 15 deep, waiting to see her and he felt she needed to take care of them. John informed his daughter she had qualified at Indy, she was low E.T. and she had made the Countdown in her rookie season. He pointed out to her that he had a 10-year segment in his career when he had nothing; when he couldn’t do anything right. Eventually, Courtney said she would go outside, so John ran out of the bus to the fans and told them she would visit with them. Courtney realizes he’s being a good father and she knows she often says things to him that she wouldn’t if she wasn’t his daughter. “We’re trying to figure out the balance this season,” Courtney commented. Despite their differences at times, John always takes time to teach his daughter there’s more to being successful than winning on the track. 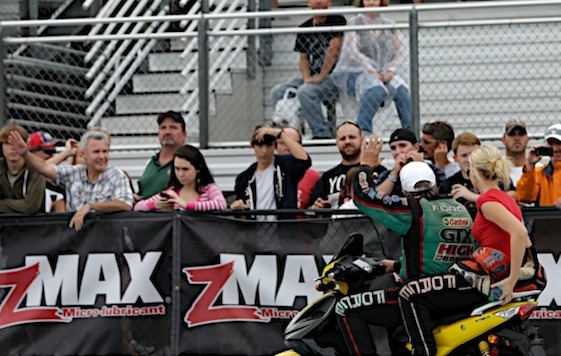 At zMAX Dragway, he treated the full John Force Grandstand and the crowd standing at the fence to him and his daughter riding a motorcycle and waving at them. “If I ran this like a boss, we’d be fighting all the time,” John said. “As good as she does, I really want perfection. I know I’m a pain to her. It’s more father-daughter, wanting to make sure she doesn’t fail. That isn’t just driving the race car. That’s with the fans; that’s with the sponsors. And at this year’s awards ceremony, John will stand on stage with Courtney.